The Republican National Convention kicks off in Cleveland this week. Expect politics to dominate headlines. Meanwhile, the basic pattern in the data still suggests an improving economy as we head toward the fall. 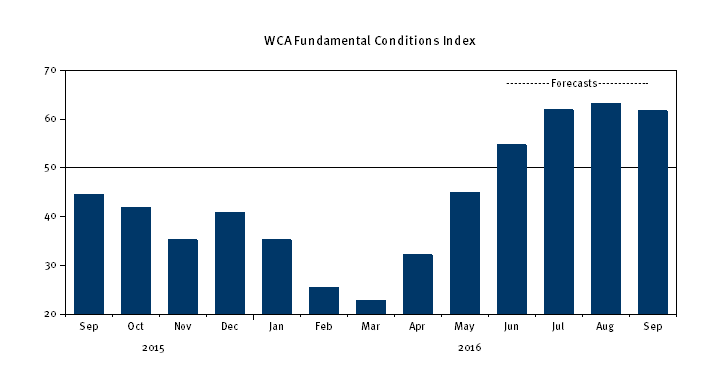 The market’s rally of late is accompanied by improvement in the WCA Fundamental Conditions Index*. Through May, the index rose to 45 and is likely to break above 50 by the time all of the data becomes available. Earnings forecasts for the S&P 500 are up four straight months, along with some surveys of business expectations. Oil prices are no longer at lows. Expectation of rate hikes have given way to little, if any, change. Real interest rates are pulling back. Credit spreads are down, market breadth is up, and latest readings on industrial production and retail sales are good. Much of this is feeding into our measurement of changing macro fundamentals. Our forecast is shown below. Last week, we saw industrial production rise by a greater-than-expected 0.6%, and capacity utilization tightened by the largest amount since 2014 (below). These are important improvements because industrial production is a fairly reliable signal about the business cycle. Given this level of output, we are growing more comfortable that economic growth is accelerating out of the doldrums seen throughout the fall and early spring. While still early in the bounce back, gathering momentum could lead growth back toward the 2.25% growth rate we forecast at the start of the year. This week will include a host of data about housing. A survey of home builders, monthly building permits and housing starts, mortgage applications, and an independent housing price index. We’ve seen steady improvement in most of these measures and expect more of the same this week. We also note that the 30-year mortgage is back near record lows. The average national 30-year mortgage rate has fallen to 3.5% from the 6-9% level common pre-financial crisis. So far so good. With a whiff of growth, the Federal Reserve (Fed) seen as “on hold,” and nowhere else to go for yield, equities are getting a bid. At some point, we must address the broader issues of weak profits and investment, low productivity growth, and ultimately when the Fed decides to resume tightening.